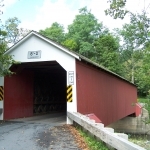 Eagleville Bridge was originally constructed in 1858 by Ephraim W. Clapp, it is listed on the National Register of Historic Places as of March 8, 1978. 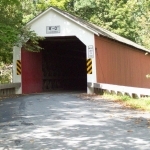 The bridge is located in the Town of Jackson-Salem, west of State Route 313 at Eagleville. 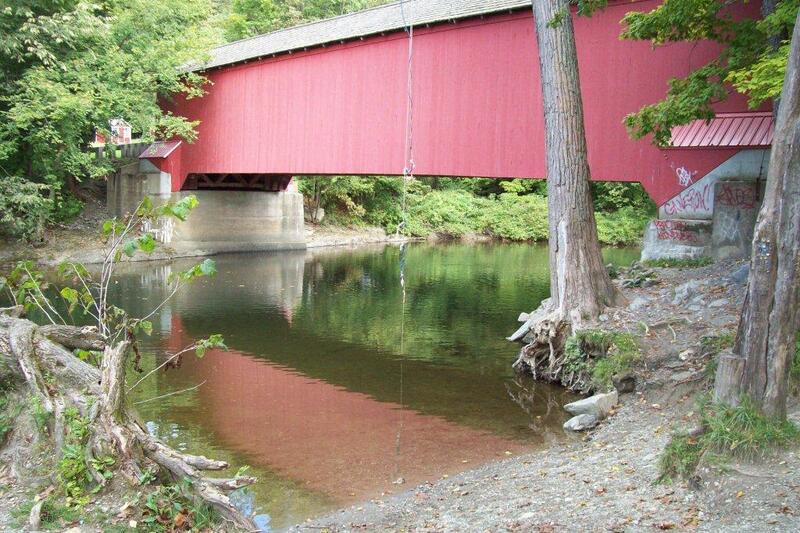 It is over the Battenkill, a single span of 100 feet of Town truss. 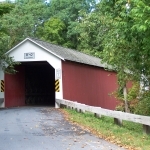 The Eagleville Covered Bridge is one of four covered bridges still standing in Washington County. 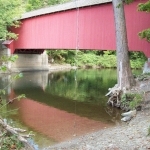 It is owned and maintained by the county and carries traffic across the Batten Kill. 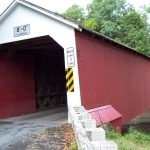 Of the other three bridges, one otheris owned by Washington County, one is owned by Rensselaer and Washington Counties, and one – the Shushan Covered Bridge − is owned by the Town of Shushan. 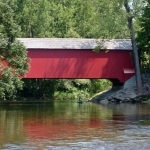 Built by Ephraim W. Clapp in 1858, this 100-foot-long,single span structure incorporates the Town lattice truss design patented on January 28, 1820, and again in 1835 by Ithiel Town of New Haven, Connecticut. 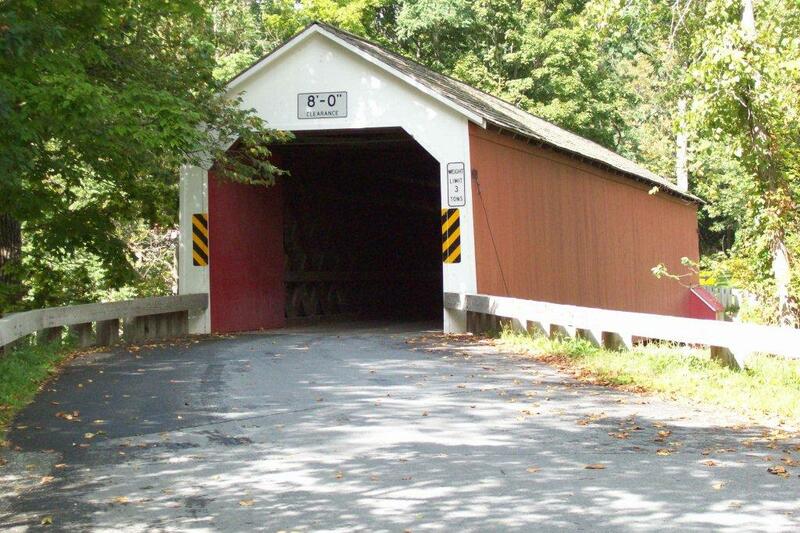 Despite flood waters, wind and harsh winters, the bridge has staying power. In March of 1977, high water on the Batten Kill undermined the east abutment, dropping it into the river. 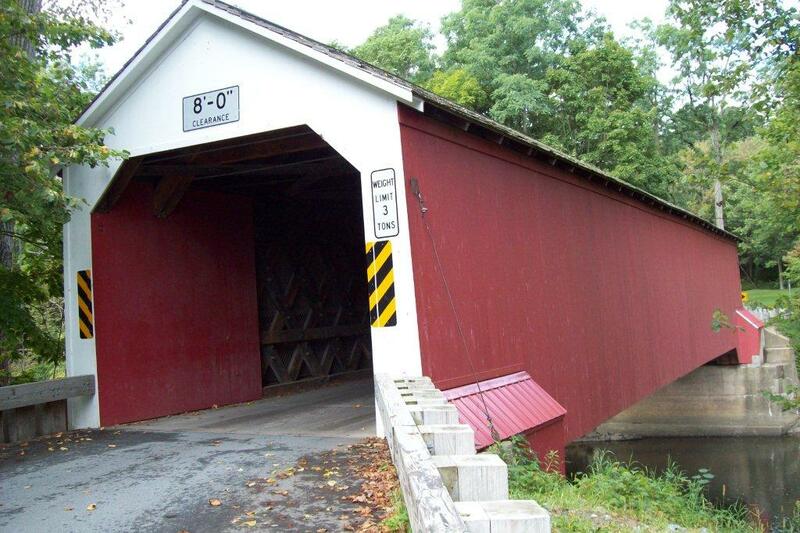 In the nick of time, the county bridge crew diverted the river, saving the bridge. 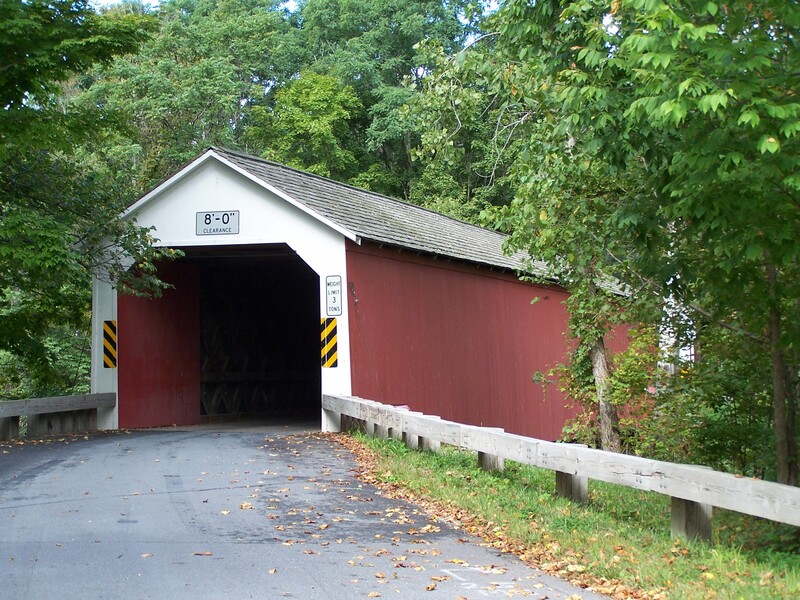 The bridge took such a twist when it went down, it was feared a great many treenails (pronounced “tunnels”) had sheared and timbers cracked. But Town’s lattice design proved to be resilient and flexible, as demonstrated by several trunnels driven out for inspection which showed no signs of distress. There pairs were made later that summer with lumber supplied by local sawyer, Roger Meyer, from clear spruce located in a paper company tract in the Adirondacks. 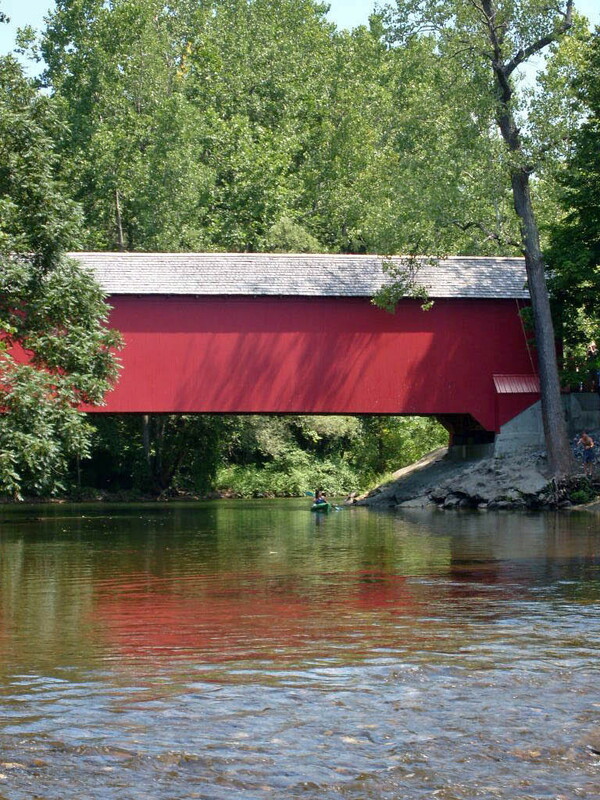 On hot summer days, traffic jams and noise threaten the famed tranquility of the Batten Kill as both the Eagleville and Rexleigh Covered Bridges are popular swimming holes. Kicking out a hole in the siding to jump through is a time-honored misuse of the bridge. Inspection doors and ventilation ports have been employed in the past as a nod to jumpers and to reduce the destruction. 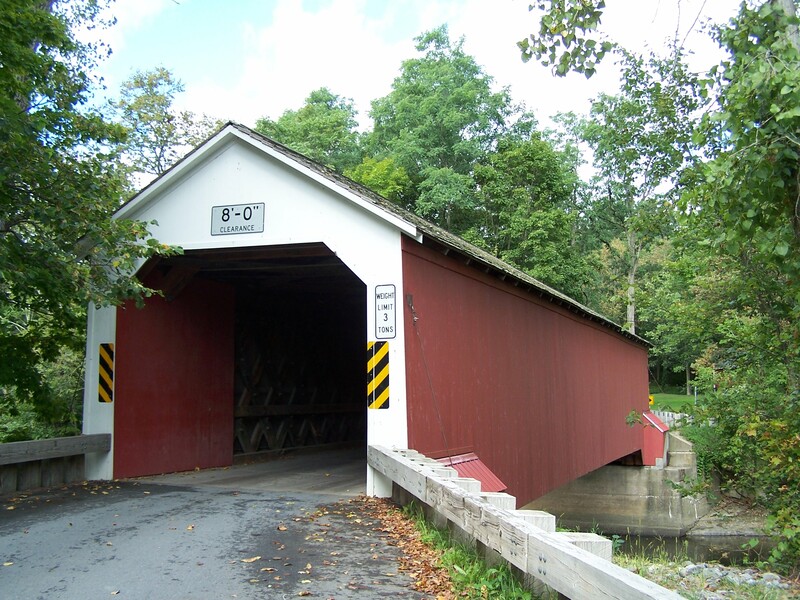 In 2006-2007, the Eagleville Covered Bridge experienced a complete rehabilitation. At that time, it was determined that there was advanced dry rot at the place where the inspection door was, caused by rain blowing in through the open door. 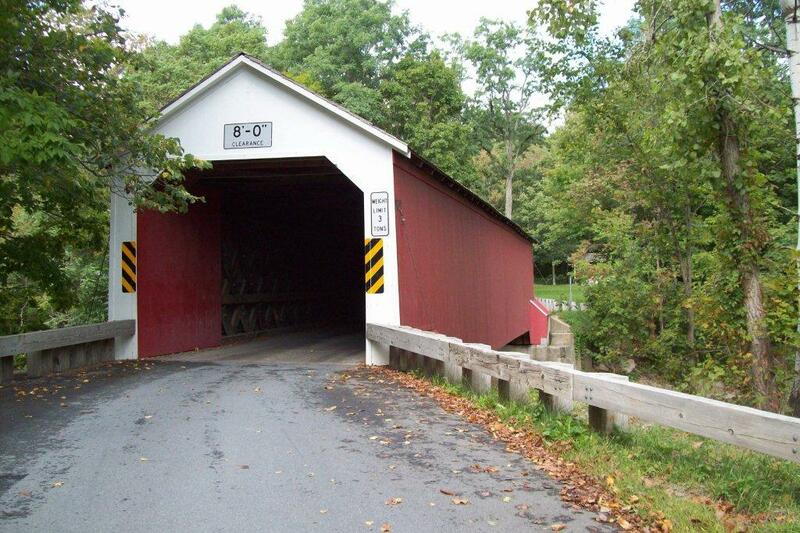 Thus, a wire mesh was installed over the inspection door between the trusses and the siding at both bridges. 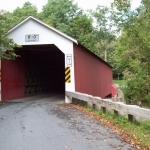 From Cambridge at the intersection of State Route 22 and State Route 313, take State Route 313 toward Vermont for 6 miles. Turn left onto Eagleville Road to the bridge.